Access to audio, video and written resources for study. Each participant will receive a questionnaire on personal goals, qualities, experience, etc so that the program will address specific as well as general needs. Students will have the option to exchange information with fellow students for one on one practice and support. 3. Mediumship Building Blocks Program: It is not enough to be aware, to understand that there is more. One does not learn to solve algebraic equations before learning numbers, decimals, adding and subtracting and yet many practice mediumship without becoming familiar with the basics. Whether a “beginner” or an “intermediate” it is never too late to form a more solid foundation of knowledge. To Register for one Part Only please send payment to http://paypal.me/boltsoflove with a description in the comments. Must Register at least 2 days in advance of class to receive the link in time. Thank you. Those registering will have access to the recordings at no additional cost. Link for the classes will be sent through the email after registration. If class cost is a hardship please email boltsoflove@gmail.com for scholarship possibilities. Level 1, 2 and 3 covered throughout the year. One may start Course Work at the beginning of any month. Those completing course work will earn certifications in Reiki 1, 2 and 3 as well as Bolts of Love Spiritual Healing training recognition. Becoming a Healer takes commitment in one’s own healing and spiritual journey. 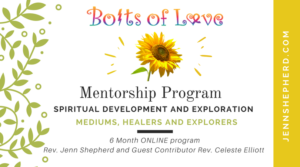 This course seeks to support you on that journey as well as bringing out the uniqueness of your own healing to fully help those around you. Assess to a digital data base of healing and spiritual books and audio files. This course includes pre-recorded and live classes with Jenn. Includes original meditations, activities and blending for healing awareness. Includes One 30 Minute private session per month with Jenn. Includes approaches and skills to work with others. This class also includes an abundance of materials. Those wishing to complete Reiki 1-3 will be able to do so by completing course work to earn certifications for levels 1-3. Those wishing may also complete coursework to receive verification of Spiritual Healing at the end of the year. Course work will include keeping a journal and completing so many hours of practice in self, absent, distant and individual healing sessions. Please send email to boltsoflove@gmail.com to register on a payment plan. Scholarships are available. Please send email to boltsoflove@gmail.com with your need/request.